Collecting tennis memorabilia can be challenging, fun, and rewarding. Discovering a tennis treasure, whether it is a postcard one doesn’t have, or a Victorian garden umpire chair, thrills the true collector. Tennis memorabilia, compared to that of golf and baseball, is relatively undervalued, allowing collectors with modest budgets to build very satisfactory collections. One of the greatest side benefits of collecting is meeting wonderful people in all walks of life, whose paths would not cross were it not for this mutual interest. Someone who collects teapots is always looking for an object within a specific range of size and shape. Not so the tennis collector! He or she can look for rackets, presses, ball cans, oil paintings, silver or ceramic objects, and unlimited printed matter such as programs, books, trade cards, advertisements, and postcards. Beginning collectors usually amass items, providing an educational lesson about quality, price, and condition. I remember trudging the fields of Brimfield, buying up junk rackets galore and meeting Jay Zirolli, an experienced collector, for the first time. He looked at my pile of rackets and said in his nasal Connecticut accent, “Geez, Jeanne, they’re not in very good condition.” He wouldn’t have put them in his garage. Accumulating can be a costly endeavor. 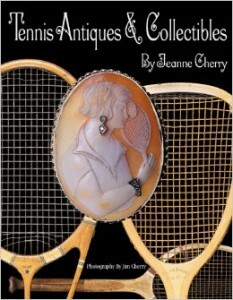 If possible it is better to visit museums, and other more advanced collectors, read books, peruse Ebay, and join the Tennis Collectors of America before deciding how to focus your collection. Buy with both your head and heart. Most regretted are the special things you did not buy when you had the opportunity, but may never see again. Decide whether you want to be a generalist, gathering examples of items related to tennis, or a specialist, collecting only ball cans, bisque figurines, or tennis spoons. A cut-off date is usually desirable, but does not have to be rigid. I violated my 1930s cut-off to buy a 1970s pinball machine named “Volley Tennis.” Buy the best quality item you can afford and pay special attention to condition. It is wiser to spend more for an undamaged item than to purchase a less perfect “bargain.” The exception, of course, would be if the item is extremely rare or the only known example. Obvious places to look for tennis memorabilia are flea markets, garage and estate sales, antique shops, auctions, and dealers who specialize in sports related items. Carrying a racket with you often prompts dealers to run after you offering tennis items. It is also a good way to meet fellow tennis collectors. There are thousands of tennis items offered on the online auction house Ebay. However, a word of caution about items offered. There are many fakes, frauds, fantasy items and also less knowledgeable people misrepresenting items unintentionally. Buyer Beware is the watchword. Less obvious places to look are vintage clothing shows, special charity sales put on by organizations such as the Junior League, and thrift shops. An often overlooked source is a fellow collector who is selling or trading duplicates or trying to raise money to add a special treasure to his collection. More affluent collectors can subscribe to a service such as Thesaurus, which, for a fee, alerts collectors to their special interests by tracking all auctions or sales and notifying them by FAX. Another effective method is to network with non-tennis acquaintances, friends, and dealers. A business card with a tennis motif instantly reminds people that you are an obsessive tennis memorabilia hunter. Some lucky collectors have found rackets and tennis posters on walls of restaurants and shops and cajoled proprietors into parting with coveted objects. Ads in local or antique newspapers can bring results. Tracking down every lead, however casual, often results in success. The old sports adage “Never give up” applies to tennis collectors as well. There are only a few museums dedicated solely to tennis, but to the collector, they are well worth the visit if you are in the vicinity or planning a trip.Wimbledon Museum, on the grounds of the All England Lawn Tennis and Croquet Club in Wimbledon, England, opened in May, 1977. Tastefully designed exhibits trace the forerunners of lawn tennis up to the present day, even providing continuous videotapes of tennis greats like Lenglen and Tilden. Curator Honor Godfrey offers revolving exhibits and the welcome new addition of the art gallery. The museum will move soon to a new site but remain on the grounds. The museum enhances the education of collectors and also houses the Ritchie Library, available for tennis research by written application to Alan Little, Librarian.The International Tennis Hall of Fame in Newport, Rhode Island states that it is the largest tennis museum in the world. On display are trophies, photos, tennis equipment and other memorabilia. Two treasures are the exquisitely crafted Russian silver 1885 Men’s Championship trophy won by Richard Sears and the Horsman Diamond racket from 1880. Every year the Hall of Fame enshrines outstanding former players and also tennis personalities. In July, 2004, the 50th anniversary celebration will feature the enshrinement of Stefan Edberg, Steffi Graf, and Dorothy “Dodo” Bundy Cheney. The Newport Casino, home of the first U.S. Men’s Championship, is worth a visit in itself. The Tennis Collectors of America will attend a reception for the honored guests on July 8, 2004. Ira Swartz, a founding member of the TCA, has donated his spectacular collection of tennis cans and boxes to the museum, a great portion of which are on display.The Tenniseum at Roland Garros Stadium in Paris, France, opened its doors in time for the French Open championships in May, 2003. Built on 2,200 square metres under court 3 and the federal pavilion, the museum features a multimedia museum with the latest in technological and interactive exhibits. There is also a workroom for children with quizzes, educational games, and fun activities. The library houses volumes ranging from the 1555 Scaino Treatise on real tennis to the latest publications and posters.The Australian Open venue in Melbourne will be the new home of the Rolf Jaeger Tennis Heritage Museum in 2005 in time for the 100th anniversary of tennis in Australia. Anyone lucky enough to see this outstanding collection when it was temporarily housed in Indian Wells, California, knows that it equals the other Grand Slam museums in many areas. Among the treasures is a rare real tennis racket trimmed in silver and velvet, a prize won in an 1860 tournament. An early tilt-head lawn tennis racket, named Henry V, is also on display along with a rare long case clock with a tennis motif, oil paintings, jewelry, silver trophies, and a fine selection of very early lawn tennis books. Dealers who specialize in tennis memorabilia usually charge higher prices than general antique dealers, but often have high quality items, which they spend time, travel, and expense to acquire. They are doing the hunting for collectors who may have less time that money or do not enjoy poking around in junk shops and flea markets. For books, Chris and Richard Jones’ Tennis Gallery, Alan Chalmers, and The Partingtons are tops. In the U.S. Ken Benner, Randy Crow, Greg and Barbara Hall, Tom Mitchell, Greg and Priscilla Wilt have a good stock of items and for books, Larry Lawrence, Wilfrid de Freitas, and Richard Hooper always have the hard to find material. Tennis items often go higher at auction than at markets or through dealers, due to the fierce competition, especially of one-of-a-kind objects. There is usually a 10-15% buyer’s premium and a sales or value added tax added to the gavel price, which increases the cost considerably and is often forgotten by the buyer in the heat of bidding. If possible it is always best to preview an auction in person to examine items carefully for chips, cracks, authenticity and general condition. The online auction service Ebay has radically altered tennis buying because of its instant access to thousands of items. The large auction house Sotheby’s has given up sport and Christies might soon follow. In England John Mulluck and Dominick Winter still hold tennis or sports auctions. John is auctioning off Pat and the late Lionel Bradford’s tennis museum on or about June 19, 2004. There are many benefits to belonging to a tennis collectors group. First is getting to know other collectors and making lasting friendships by mutual interests. Other benefits are sharing information, reading and writing articles, and getting together at annual meetings for seminars, buy and sell, and show and tell. Tennis Collectors of America is a newly formed group of collectors dedicated to preserving the history of tennis and promoting the collecting of tennis memorabilia. With a website and a journal, it promises to be of great and ongoing value to the collector, dealer and tennis historian. It is organized as a non-profit with a Board of Directors, officers, a webmaster and a journal editor. Gerald Gurney’s group, the Tennis Collectors Society, was formed in England several years ago and is coming up on the 50th issue of its publication. It has grown from a typewritten mimeographed newsletter to 20 pages of excellent articles and information, thanks to the computer skills of Bob Everitt. There are still lots of treasures to be found. Good hunting!